THE VICE PRESIDENT: Hey, folks, how are you? (Applause.) It's a good day. (Applause.) It's a real good day. As some of my colleagues can tell you, this is a long time in coming. But I am happy it's here. Ladies and gentlemen, welcome. Please be seated. It was a great five-star general and President, Dwight D. Eisenhower, who once said, "Though force can protect in emergency, only justice, fairness and consideration, and cooperation can finally lead men to the dawn of eternal peace." By repealing "Don't Ask, Don't Tell" today, we take a big step toward fostering justice, fairness and consideration, and that real cooperation President Eisenhower spoke of. 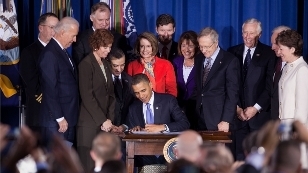 Mr. President, by signing this bill, you will be linking military might with an abiding sense of justice. You'll be projecting power by promoting fairness, and making the United States military as strong as they can be at a time we need it to be the strongest. AUDIENCE: Yes, we did! Yes, we did! Yes, we did! THE PRESIDENT: Thank you! Yes, we did. AUDIENCE MEMBER: Thank you, Mr. President! AUDIENCE MEMBER: Yes, it is! AUDIENCE MEMBER: You rock, President Obama! You know, I am just overwhelmed. This is a very good day. (Applause.) And I want to thank all of you, especially the people on this stage, but each and every one of you who have been working so hard on this, members of my staff who worked so hard on this. I couldn't be prouder. Sixty-six years ago, in the dense, snow-covered forests of Western Europe, Allied Forces were beating back a massive assault in what would become known as the Battle of the Bulge. And in the final days of fighting, a regiment in the 80th Division of Patton's Third Army came under fire. The men were traveling along a narrow trail. They were exposed and they were vulnerable. Hundreds of soldiers were cut down by the enemy. And during the firefight, a private named Lloyd Corwin tumbled 40 feet down the deep side of a ravine. And dazed and trapped, he was as good as dead. But one soldier, a friend, turned back. And with shells landing around him, amid smoke and chaos and the screams of wounded men, this soldier, this friend, scaled down the icy slope, risking his own life to bring Private Corwin to safer ground. For the rest of his years, Lloyd credited this soldier, this friend, named Andy Lee, with saving his life, knowing he would never have made it out alone. It was a full four decades after the war, when the two friends reunited in their golden years, that Lloyd learned that the man who saved his life, his friend Andy, was gay. He had no idea. And he didn't much care. Lloyd knew what mattered. He knew what had kept him alive; what made it possible for him to come home and start a family and live the rest of his life. It was his friend. So this morning, I am proud to sign a law that will bring an end to "Don't Ask, Don't Tell." (Applause.) It is a law -- this law I'm about to sign will strengthen our national security and uphold the ideals that our fighting men and women risk their lives to defend. That's why I believe this is the right thing to do for our military. That's why I believe it is the right thing to do, period. I also want to commend our military leadership. Ending "Don't Ask, Don't Tell" was a topic in my first meeting with Secretary Gates, Admiral Mullen, and the Joint Chiefs. (Applause.) We talked about how to end this policy. We talked about how success in both passing and implementing this change depended on working closely with the Pentagon. And that's what we did. And two years later, I'm confident that history will remember well the courage and the vision of Secretary Gates -- (applause) -- of Admiral Mike Mullen, who spoke from the heart and said what he believed was right -- (applause) -- of General James Cartwright, the Vice Chairman of the Joint Chiefs; and Deputy Secretary William Lynn, who is here. (Applause.) Also, the authors of the Pentagon's review, Jeh Johnson and General Carter Ham, who did outstanding and meticulous work -- (applause) -- and all those who laid the groundwork for this transition. And finally, I want to express my gratitude to the men and women in this room who have worn the uniform of the United States Armed Services. (Applause.) I want to thank all the patriots who are here today, all of them who were forced to hang up their uniforms as a result of "Don't Ask, Don't Tell" -- but who never stopped fighting for this country, and who rallied and who marched and fought for change. I want to thank everyone here who stood with them in that fight. Now, with any change, there's some apprehension. That's natural. But as Commander-in-Chief, I am certain that we can effect this transition in a way that only strengthens our military readiness; that people will look back on this moment and wonder why it was ever a source of controversy in the first place. I have every confidence in the professionalism and patriotism of our service members. Just as they have adapted and grown stronger with each of the other changes, I know they will do so again. I know that Secretary Gates, Admiral Mullen, as well as the vast majority of service members themselves, share this view. And they share it based on their own experiences, including the experience of serving with dedicated, duty-bound service members who were also gay. Finally, I want to speak directly to the gay men and women currently serving in our military. For a long time your service has demanded a particular kind of sacrifice. You've been asked to carry the added burden of secrecy and isolation. And all the while, you've put your lives on the line for the freedoms and privileges of citizenship that are not fully granted to you. You're not the first to have carried this burden, for while today marks the end of a particular struggle that has lasted almost two decades, this is a moment more than two centuries in the making. There will never be a full accounting of the heroism demonstrated by gay Americans in service to this country; their service has been obscured in history. It's been lost to prejudices that have waned in our own lifetimes. But at every turn, every crossroads in our past, we know gay Americans fought just as hard, gave just as much to protect this nation and the ideals for which it stands. And so, as the first generation to serve openly in our Armed Forces, you will stand for all those who came before you, and you will serve as role models to all who come after. And I know that you will fulfill this responsibility with integrity and honor, just as you have every other mission with which you've been charged.